As if there weren't enough Android tablets with 10-inch screens on the market to make choosing one over the others an already difficult task, Samsung Electronics has thrown another option into the ring with the Galaxy Tab S 10.5. The Galaxy Tab S 10.5 runs on Samsung's own Exynos 5 processor -- with four cores at 1.9GHz and another four cores at 1.3GHz -- or a quad-core Snapdragon 800 processor from Qualcomm with a 2.3GHz clock speed. 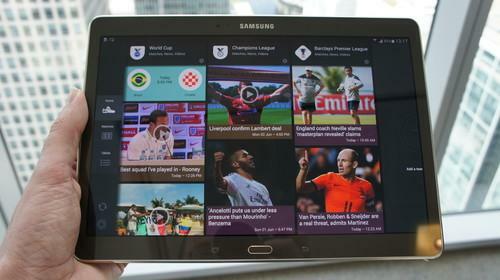 Sony's tablet relies solely on the Qualcomm processor. When Samsung launched the Galaxy Tab S 10.5 Thursday it boasted a lot about the tablet's screen, which is based on the company's Super AMOLED technology, measures 10.5 inches and has a 2560 by 1600 pixel resolution. However, the 10.1-inch screen on the Xperia Z2 Tablet is no slouch with 1200 by 1920 pixels. The Wi-Fi version Xperia Z2 Tablet is slightly lighter and slimmer at 426 grams and 6.4 millimeters versus the Galaxy Tab S 10.5's 465 grams and 6.6 millimeters. However, the surface size of the Samsung device is smaller at 247.3 by 177.3 millimeters versus 266 by 172 millimeters for the Galaxy Tab S.
The Galaxy Tab S and the Wi-Fi version of the Xperia Z2 Tablet have either 16GB or 32GB of integrated storage, while the LTE version of the Sony tablet has 16GB. The storage can be expanded using a microSD card by up to 64GB on the Sony and 128GB on the Samsung tablet. They both have 3GB of RAM. The Galaxy Tab S wins this round with a 7,900 mAh battery, while owners of the Xperia Z2 Tablet have to make do with 6,000 mAh. Sony's Xperia Z2 Tablet is already available, while the Galaxy Tab S 10.5 will start shipping early in July. They both cost from US$499.